A bronze 'Kostol Type' sports helmet mask with strong realism, 'Type A' of the Robinson classification of cavalry sport helmets (Robinson, 1975, pl.309, p.112), showing the portrait of a youthful African male, possibly that of the Mauri Prince, Lusius Quietus; with broad forehead, high cheekbones, short, wide nose with wide mouth and small, pierced almond-shaped eyes; locks of hair on the head in a series of semi-circular bands; rear edge of mask pierced for attachment of the leather lining; the wide eye-holes terminate with flanges representing the eye-lids; traces of burning are visible on the forehead, nose, around left eye and right cheek. 1.59 kg total including stand, 29cm without stand (11 1/2"). Very fine condition, minor restoration and edge loss. Excessively rare. Property of a South London collector; previously in a German collection prior to 1980; accompanied by an academic report by military specialist Dr Raffaele D'Amato, and by a metallurgic analytical report, written by Metallurgist Dr. Brian Gilmour of the Research Laboratory for Archaeology and the History of Art, University of Oxford, number 529, dated 14 August 2017. See Robinson, R., The Armour of Imperial Rome, New York, 1975; Garbsch, J., Römische Paraderustüngen, München, 1979; D'Amato R., Negin, A., Decorated Roman Armour, London, 2017; the mask helmet finds a good parallel in the Kostol helmet (Garbsch,1979, pl. 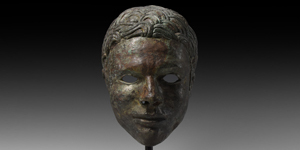 23,3), although differs for the kind of portrait; it belongs to the category of Roman mask helmets usually employed in the sportive games, acting also for military training, of the so called Hippika gymnasia, well described by Arrian of Nicomedia in his Taktika, written down during the age of the Emperor Hadrian (117-138 AD); mask helmets were produced in all of the Empire until at least the late 4th century AD, they were however also destined to be worn in real combat, as shown by the gravestone of Flavinus at the Hexham Abbey (Robinson, 1975, pl.307, p.106; D'Amato-Negin, 2017, p.150, fig.158), and Sextus Valerius Genialis at Cirencester (D'Amato-Negin, 2017, p.82, fig.78); the 'Type A' to which the mask belongs, is extremely rare, and it shows mask helmets still strongly influenced by the Hellenic taste; the face and the hair are treated with strong realism, in a extremely naturalistic manner, different from the classical form seen in the similar helmets of Alexander Typology; as supported by Robinson these category of helmet was probably realised by artists trained as sculptor specialists in portraiture; however, differently from the Kostol helmet in which the whole skull acts also as a bowl, here the mask was destined to be attached to a second part, in a similar way to the other well known portrait helmet mask known from Stockstadt (Garbsch,1979, pl.20,3), and to the masks of 'Alexander Type' (D'Amato-Negin, 2017, pp.194). Most probably this specimen is from a grave of a soldier or military commander. The helmet is hemispherical and imitates abundant curly hair which is made in a realistic fashion. In addition, the helmet is unusual due to the fact that its design and appearance demonstrate a combination of several traditions in manufacturing of military headgear, like the Kostol one. The bottom edge of the helmet could be also bent in the form of a hem and have a continuity of holes intended either to attach the lining, or to suspend some sort of neck protection in the form of a lamellar or scale aventail, which is not typical of Roman helmets, worn in the Roman army only by soldiers of Eastern auxiliary units. The mask portrait is the one of a young African prince, or man, in an age in which Africans (Numidians) were highly considered in the Auxilia military forces serving under Trajan and Hadrian. It should well be remembered the important tasks accomplished by the Mauri of Lusius Quietus during the Trajanic wars against the Dacians, and also during the repression, in the last years of the Trajan's Empire, of the Jewish revolt in the so-called Kitos war (116-118 AD). We cannot exclude that the mask was destined to a member of his family, or to a portrait of the Prince himself, considering the similarity of this portrait with the presumptive image of Quietus on Trajan's Column (Cichorius, scene LXIII). According to Arrian of Nicomedia, a Roman provincial governor and a close friend of Hadrian, face-mask helmets were used in cavalry parades and sporting mock battles called hippika gymnasia. Parades or tournaments played an important part in maintaining unit morale and fighting effectiveness. They took place on a parade ground situated outside a fort and involved the cavalry practising manoeuvring and the handling of weapons such as javelins and spears. Parades would have taken place at several times in the year, especially at religious festivals and on days marking the birth, and accession to the throne, of the Emperor. Hippika gymnasia were colourful tournaments among the élite cavalry wings of the army, the alae. Both men and horses wore elaborate suites of equipment on these occasions, often in the guise of Greeks and Amazons. Calvary helmets were made from a variety of metals and alloys, often from gold-coloured alloys or iron covered with tin. They were decorated with embossed reliefs and engravings depicting the war-god Mars and other divine and semi-divine figures associated with the military.